It's the time of year where we are supposed to reflect on what we are thankful for. 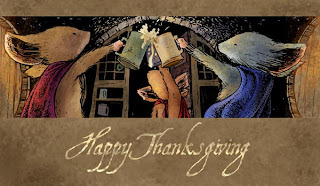 And while I am very thankful for the success of Mouse Guard and all that it has allowed me to do, I am most thankful for the people in my life that I get to share that with. I am also very thankful for the fans who made that all possible. Wish I had more to share. I'll have a few announcements next post. 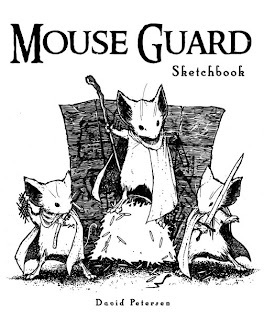 I received an e-mail the other day from a Mouse Guard fan who mentioned the first sketchbook I released*. He thought it would be good to share the images with the fans who may have not ever seen them due to the limited printing. I don't want to share the whole sketchbook, mainly because of the flaws I see in many of the images. This sketchbook was done after Issue 1 was out in black-and-white, but before the color version had been released. 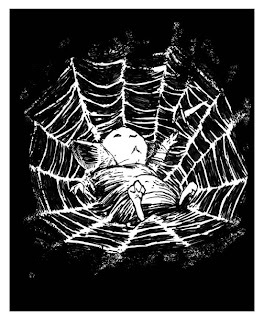 (I had promised when the b&w #1 came out, that I would have the next issue at the following Motor City show, however, Archaia became my publisher and Issue 2 wasn't going to be out until after issue 1 was colored and released through them. So as an olive branch to the fans I promised #2 to, I had a sketchbook ready). 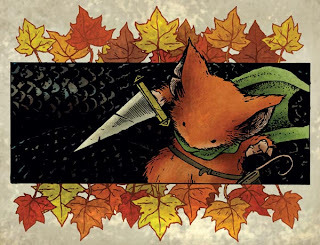 Mouse Guard started as a different story with many species of animal, including wolves. 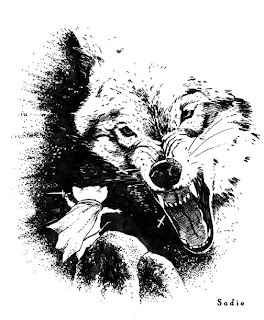 So when the mice became the focus of the stories I wanted to tell and the rest of the world became a backdrop that the mice never want to see, the wolves became backdrop as well. However, I included their presence in the end of the Fall series beyond the mysterious 'scent border'. I don't know exactly how Sadie is going to fare against this beasty, but I do like the idea that a skilled Guard could take down a lone wolf. I have more plans for the wolves and the 'scent border' in future MG series. 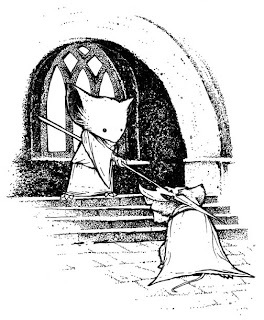 Concerning mice....quite content to ignore and be ignored by the world of the Big Folk...a passion for food...the smoking of pipes...and a keen interest in the brewing of ales. When figuring out how mice would live, what pleasures they take, I kept coming back to the life of a Hobbit..because, who doesn't want to live in the Shire really?? It's relateable and I wanted my mice to have that. This drawing of Saxon sitting on an ale barrel was something I looked at later when doing the epilogue with Saxon and Kenzie in the Lockhaven Casks. I worried a bit about having the mice drink alcohol when MG is such a kid-friendly book. But, I don't feel like it's a problem really. With the exception of Conrad, the drink is all depicted as being consumed in moderation. 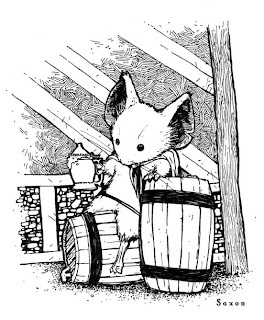 It's an authentic part of medieval life (both real and fantasy) and ignoring it or pretending it doesn't exist seemed like the more harmful message than to show a mouse with a tankard or two of some stout brew. The original character concept was to have a mouse with all black fur and not a hair of any other color. This sketch shows that I intended to ink the fur in, but realized when it was time to include him in the books, that it would be too difficult to make him look interesting and not like an ink spill (especially in his armor). This was the first design for the armor. 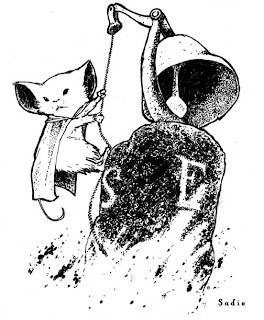 Many of the elements stayed, but I simplified the design knowing that I'd be drawing LOTS of mice with it eventually. The sword is based on the pin-up artwork provided by Jeremy Bastian in issue 6. It was actually the first pin-up turned in for the series. I liked the sword design so well that I not only toyed with Midnight having it, but I also gave it to Lieam after he cuts his binds. Jeremy also out-did me on Midnight's armor when he did his pin-up for issue 5. I really like how he modified my design...if that armor is ever seen again, I'll be looking to Jeremy's piece again for inspiration. As a part of Sadie's background I had her rejoining the Guard's patrol after being stationed at the shore outpost Frostic. Frostic will play a larger role in future MG stories. The bell Sadie is ringing here is a part of Frostic and has be incorporated into the design of that location now. I'm not fond of Sadie's face and ears in this drawing though, but I do like the 'negative space' wave splashing against the rock holding them both up. I knew becoming a guard was going to be a special occasion, and wanted to try sketching out what that ceremony may look like. 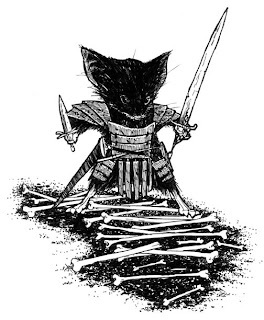 Since then Luke Crane (who is writing the MG RPG) asked me "how does one become a Guard? What is the training? what is the time-frame?" It got me thinking about this image again. I may show the ceremony down the road, and if I do, I'll start with this image, throw in equal parts Hogwarts sorting ceremony and A New Hope's medal scene and dust with a touch more of Edmund Leighton. So there ya have it, 6 of the pages from the first sketchbook. Next post I'll try not to blather on as much.